​“The Easter promise is that the banquet is ready, new life is bursting all around us, even in the midst of death, and that all eternity has been prepared for us as we make it real even now,” Bishop Skip Adams says in his message for Holy Week and Easter 2019. All Saints, Hampton: 9 am Easter Service, followed by Easter Brunch. All Saints, Hilton Head Island: 8:00 a.m. Festive Holy Eucharist with Chamber Choir. 10:15 a.m. Festive Holy Eucharist with Parish Choir and instruments. 11:45 am Easter Egg Hunt. The Episcopal Church in Cheraw: 10:30 a.m. Easter Eucharist at Old St.David’s Church with the Rev. Mike Bye. Christ Church, Denmark: 11:00 am Easter service. ​Episcopal Church on Edisto: 9:45 a.m. Flowering of the cross, 10:00 a.m. Easter service​. Holy Communion, Charleston: 8:00 a.m. Low Mass. 9:30 a.m. Children's Egg Hunt. 10:00 a.m. Flowering of the Cross. 10:30 a.m. Solemn Mass of Easter. 10:30 a.m. Easter Service & Holy Eucharist followed by Children's Easter Egg Hunt. St. Francis, Charleston: 8:30 a.m. Easter service. St. Mark's, Charleston: 10:00 a.m. Easter Day service. St. Stephen's, Charleston: 9:00 a.m. Holy Eucharist with Baptism including an adult homily and Easter children's message. Children will be invited forward to hear from the Rector and observe the Baptism up close. 10:15 a.m. Easter Egg Hunt. 11:00 a.m. Festival Eucharist. For both services: All are welcome to bring a flower for flowering of the Easter Cross, and child care is provided. St. Stephen's, North Myrtle Beach: 7:30 a.m. Holy Eucharist. 9:30 a.m. Holy Eucharist. 11:30 a.m. Holy Eucharist. St. Thomas, North Charleston: 8:00 a.m. Easter Day Service. 10:30 a.m. Easter Day Service, followed by Easter Reception and Egg Hunt. 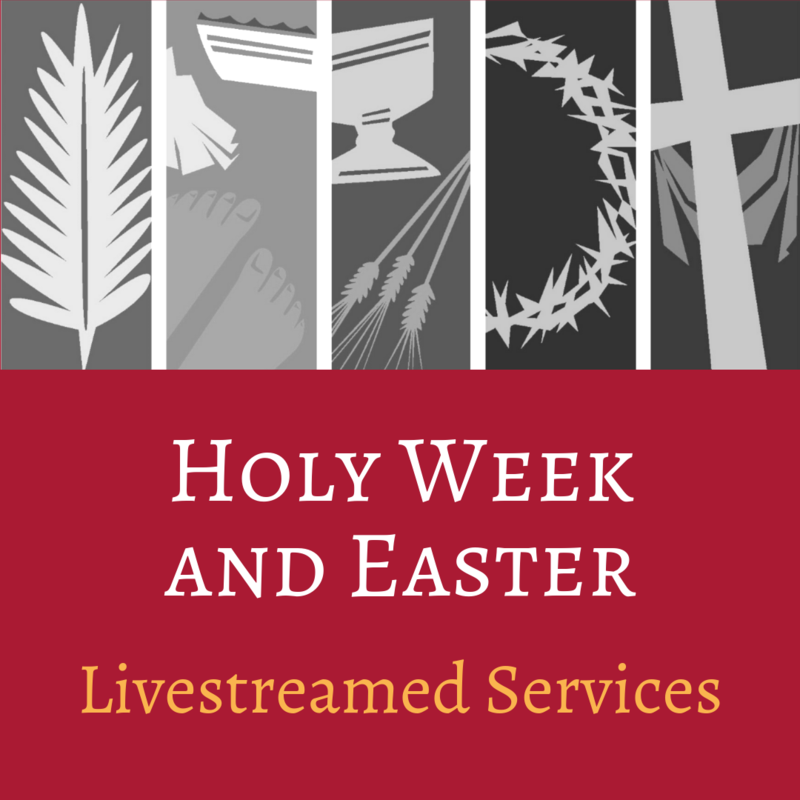 Visit this page to find links to live online streaming of Episcopal church liturgies during Holy Week and Easter. “In the moments of despair, in the moments of the worst darkness, God had done something incredible,” Presiding Bishop Michael B. Curry says in his Easter 2019 Message. “God had raised Jesus from the dead.” Find the text here. 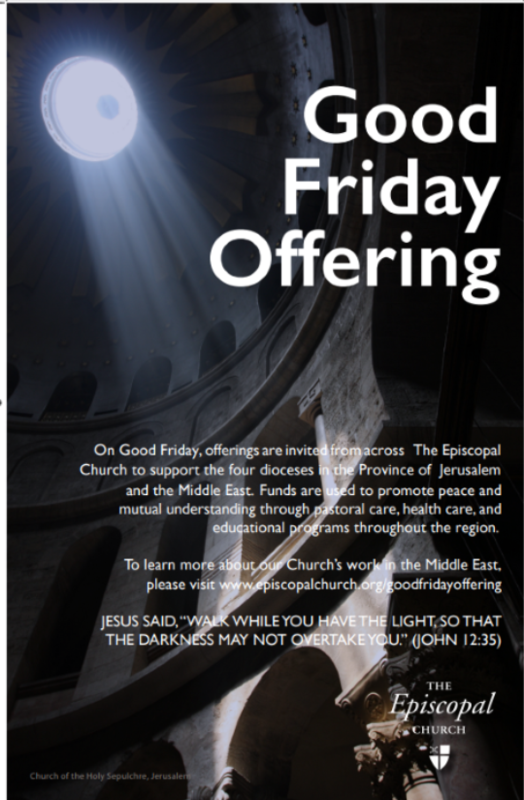 The history of the Good Friday Offering reaches back to 1922 when, in the aftermath of World War I, The Episcopal Church sought to create new relationships with and among the Christians of the Middle East. The generous donations of Episcopalians help the Christian presence in the Land of the Holy One to be a vital and effective force for peace and understanding among all of God’s children. Find posters, bulletin inserts, Presiding Bishop Curry's letter, and other resources here. The Episcopal Church in Cheraw: Passion Liturgy and Morning Prayer at 10:30 a.m.
Christ Church, Denmark: 11:00 am Palm Sunday service. Epiphany, Summerville: 9:00 a.m. Blessing of the Psalms and Holy Eucharist Rite II. Grace Church Cathedral: Liturgy of the Palms and Eucharist at 8:00, 9:00, and 11:00 a.m. Holy Eucharist at 5:30 pm. Church of the Messiah, Myrtle Beach: 10:00 a.m Liturgy of the Palms, Readinig of the Passion, and Holy Eucharist. St. Catherine's, Florence: 11:30 a.m. Liturgy of the Palms and the Reading of the Passion. St. Francis, Charleston: 8:30 a.m. Palm Sunday service. St. George's, Summerville: Liturgy of the Palms, the Passion Gospel, and Holy Eucharist at 7:45, 9:00 and 11:15 a.m. Special Children's Palm Sunday service at 10:15 a.m.
St. James-Santee, McClellanville: 10:00 a.m. Palm Sunday Service. St. Mark's, Charleston: 10:00 a.m. Palm Sunday service. St. Mark's, Port Royal/Beaufort: 9:00 a.m. and 11:00 a.m. Liturgy of the Palms, Passion Narrative and Holy Eucharist. St. Stephen's, Charleston: 8:00 a.m. and 11:00 a.m. Palm Sunday services. St. Stephen's, North Myrtle Beach: 8:00 a.m. Liturgy of the Palms and Holy Eucharist. 10:30 a.m. Liturgy of the Palms and Holy Eucharist. St. Thomas, North Charleston: 8:00 a.m. Palm Sunday service. 10:30 a.m. Palm Sunday service with bagpipe procession, followed by Bread and Soup Luncheon. Grace Church Cathedral: Holy Eucharist at 12 pm and 5:30 p.m.
Holy Communion, Charleston: 8:00 a.m. Low Mass and Sermon. 6:30 p.m. Low Mass and Sermon. St. George's, Summerville: 7:00 p.m. Mary's Way of the Cross. Follow the mother of Jesus as she walks the road to Calvary where Jesus was crucified, emphasizing her sense of surrender. St. Stephen's, North Myrtle Beach: 10:30 a.m. Holy Eucharist. St. George's, Summerville: 12:10 p.m. Holy Tuesday Healing Service. Prayers for healing, anointing with oil and communion from the reserved sacrament, with special prayers of intercession for the parish and community. Holy Communion, Charleston: 6:30 p.m. Solemn Mass, Stripping of the Altar and Vigil at the Altar of Repose. Child care provided. Holy Cross Faith Memorial, Pawleys Island: 7:00 p.m. Holy Eucharist and Washing of Feet, followed by the Gethsemane Watch from Thursday evening until 12:30 p.m. on Good Friday. St. Anne's, Conway: 6:00 p.m. Maundy Thursday Liturgy at Lackey Chapel. St. Catherine's, Florence: 6:00 p.m. Maundy Thursday service. St. George's, Summerville: 6:30 p.m. Hand blessing, Holy Eucharist and stripping of the altar. St. Stephen's, Charleston: 5:30 p.m. Maundy Thursday Liturgy with Foot Washing followed by a Vigil with the reserved sacrament until midnight. St. Stephen's, St. Stephen: 6:30 p.m. (at St. Alban's, Kingstree) - Combined Maundy Thursday service with congregation of St. Alban's. St. Thomas, North Charleston: 7:00 p.m. Maundy Thursday service. All Saints, Hilton Head Island: 12:00 p.m. Good Friday Liturgy with Voce Sacre. Holy Communion, Charleston: 12:00 pm Good Friday Liturgy, Veneration of the Cross and Preaching of the Passion. 6:30 p.m. Stations of the Cross. Holy Cross Faith Memorial, Pawleys Island: Good Friday Blood Drive, 10:00 a.m.-3:00 p.m. in the Parish House. 10:00 am Stations of the Cross at the Murrells Inlet Marshwalk (meet at the parking lot of The Claw restaurant). ​12:30 p.m. Good Friday Liturgy in the church. St. Alban's, Kingstree: 3:00 p.m. (at St. Stephen's, St. Stephen) - Good Friday combined service with members of St. Stephen's. St. Anne's, Conway: (at St. Philip Lutheran , 6200 N. King's Hwy, Myrtle Beach, SC 29572) 12:15 p.m. Good Friday Service; and 7:00 p.m. Good Friday Service. Held jointly with Church of the Messiah, Myrtle Beach. St. Mark's, Charleston: 12:00 p.m. Good Friday Liturgy. 6:00 p.m. Stations of the Cross. St. Mark's, Port Royal/Beaufort: 12:00 p.m. Good Friday Liturgy. St. Stephen's, Charleston: 5:30 p.m. Good Friday service with distribution of Holy Communion. St. Stephen's, North Myrtle Beach: 3:00 p.m. Stations of the Cross. St. Thomas, North Charleston: 12:00-3:00 p.m. Good Friday service. St. George's, Summerville: Holy Saturday, Egg Hunt on the church grounds. St. Stephen's, Charleston: 10:00 a.m. Service with Distribution of Holy Communion. St. Stephen's, North Myrtle Beach: 5:00 p.m. Waiting in the Tomb Prayer Vigil.